Get Access to New Gold Mining Areas – 7 Awesome Tips! 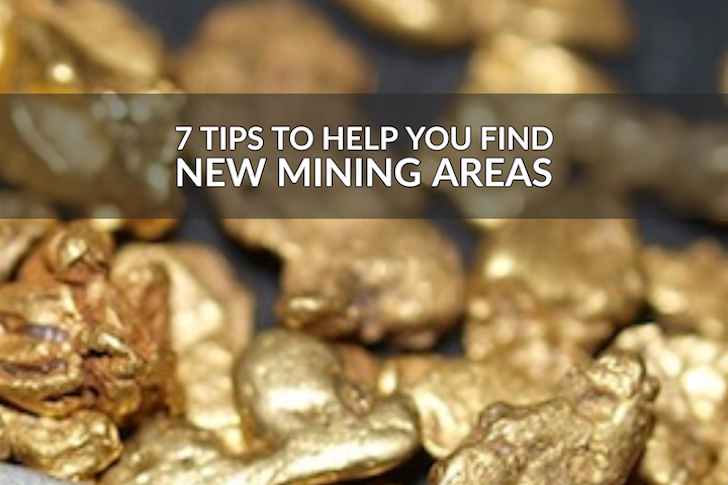 Home > Get Access to New Gold Mining Areas – 7 Awesome Tips! Sometimes it can be challenging to find an area to go gold prospecting. Most of the best places are already claimed, and sometimes you will spend more time driving around and looking at claim posts than you will actually prospecting! Perhaps the easiest way to gain access to a mining claim is to join a local prospecting club. 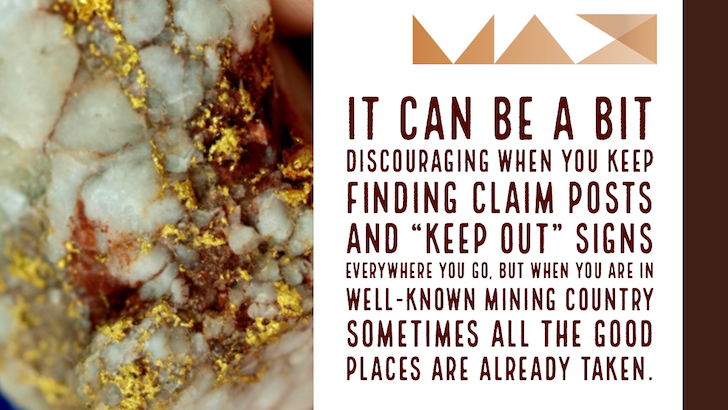 Most prospecting clubs have a few mining claims that are open to members who pay their dues. The Gold Prospector’s Association of America is a nationwide club that does the same thing. The nice thing about the GPAA is that they have claims in lots of different states, so if you like to travel and explore it might be a good choice. While this might not be as adventurous as other types of gold prospecting, it’s definitely the easiest. There are companies that will let you pay a fee to gain access for the day. Sometimes they have nice gold panning setups and will even pile up the paydirt for you, so you don’t have to do any digging or anything! This can be a nice option if you have kids and want them to find some gold without too much effort. Doing a bit of research and trying to locate some places that “off the beaten path” is one of the better ways to successfully find gold. Don’t just go to the same old places that everyone else does. There are a lot of good resources out there to help you. Wintertime is a great time to do your research, so you will be ready to get out and start exploring once spring gets here. This is an idea that many people simply don’t do, but it has gotten me on some great gold prospecting areas. Don’t get discouraged when you find claim markers everywhere; instead, figure out who owns the claim and see if you can get access! You might be surprised how many claim owners will let you do a little digging on their claim if you simply ask. Particularly if you are just doing a bit of panning or sluicing for the day, and you don’t intend to move a lot of material. If you have bigger plans, you might offer a deal to the claim owner for access. Commonly this is a split of the gold found. For example, a common split is to offer 10% or 20% of the total amount of gold that you find. If you start making deals, don’t get too carried away with what you offer. I have had claim owners request a 50/50 split, and I politely decline. I am the one doing all the hard work, and if I am going to have to give half of my gold away for access I will probably just find another area to mine. Make sure it is worth your while. I have gotten access to several great prospecting areas by meeting up with friends that I met on online forums. Some of the active forums have hundreds of miners, and quite a few of them have claims. Now I’m not telling you to join forums with the sole purpose of trying to gain access to other people’s mining claim. What I am saying is that they are great places to make friends with fellow miners, and with time you might want to meet up in the real world and do some prospecting. It’s always good to know people in the hobby. It can be a bit discouraging when you keep finding claim posts and “Keep Out” signs everywhere you go, but when you are in well-known mining country sometimes all the good places are already taken. One tip that has really paid off for me over the years is to prospect in areas that are outside of the traditional mining area. Places that are nearby, but still outside of the traditional places that everyone else goes. This method definitely takes some patience, because you are going to come up empty-handed a lot more often than not. However, when you do find an area that has gold, you have a much better chance that you will find a lot of it, because no one has ever been there before. And there are still undiscovered gold deposits out there. Some of them are extremely rich! Ok, this isn’t exactly the same as prospecting, but if you’ve got the itch to find some gold and you just can’t seem to find a place to go then maybe you just need to buy a bag of paydirt. I think the best paydirt comes from real mine concentrates, rather than from “salted” bags. This is more of a real mining experience. No, it’s not the same as going out and finding it yourself, but you still get the pleasure of picking some gold out of the bottom of your pan!